September 19, 2016 by Beeraj Patel, Esq. Engaged to be married to a foreigner, and planning to reside in the United States? The fiancé(e) visa, or K-1 nonimmigrant visa, allows U.S. citizens who are planning to marry foreign nationals living overseas to bring their betrothed legally into the country. There are several requirements to the K-1 visa process mandated by the United States government that are detailed below. First, the petitioner must prove he (or she) is a United States citizen. Next, the petitioner must provide evidence he intends to marry within 90 days of his fiancé(e)’s entry into the country. Third, the petitioner and fiancé(e) must demonstrate they are free to marry; that is, both parties must have legally ended any prior marriages by divorce, annulment or death — or never have previously married. Last, both parties need to show they’ve met each other in person at least one time within two years of filing the visa petition. If this hasn’t happened, there are two exceptions that can be granted by filing a waiver. These exceptions are: (1) that a prior meeting would violate customs or social norms of the culture to which the petitioner and/or fiancé(e) belong, or (2) the meeting would result in “extreme hardship” to the petitioner. The waiver for these exceptions must be filed with accompanying proof. If the petitioner meets all of these requirements, he should file Form I-129F, Petition for Alien Fiancé(e). This is the official documentation that is needed in order for a potential spouse and his/her children to enter the country, and to be processed for permanent resident status. There is a $340 filing fee. USCIS will run background checks on both parties at this time. The documentation required for the K-1 visa includes: (1) Form DS-160, Online Nonimmigrant Visa Application, (2) a passport valid for travel to the U.S. (dated at least six months beyond the fiancé(e)’s intended stay in the country), (3) police certificates from the current country of residence for the potential spouse, or from any previous countries of residence, (4) a valid medical examination performed by an authorized physician (vaccines are encouraged but not required), (5) evidence the applicant can financially support him or herself, (6) two 2X2 photographs, (7) payment of fees. The consular also may ask for additional information to prove the relationship between both parties is genuine. In addition to reviewing the materials supplied, the Department of State will then conduct background checks on the applicant, including fingerprint testing. 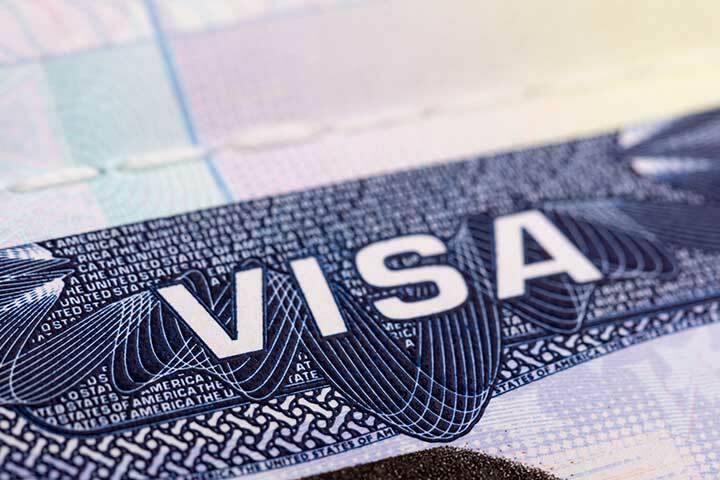 If the applicant is denied a visa, there may be several reasons, including overstaying a previous visa, drug trafficking, or submitting fraudulent documents. The length of time for a K-1 visa to be issued varies from case to case, depending on whether the application materials are complete and specific. This may make it difficult to plan a wedding far ahead of time. However, after the K-1 visa has been granted, the fiancé(e) must enter the country within six months, and subsequently marry within 90 days of arrival in the U.S.
After the marriage ceremony, the new spouse can apply for permanent residence (Form I-485, Application to Register Permanent Residence or Adjust Status) to remain in the United States, and can also apply for permission to work. (This can be done by filing Form I-765, Application for Employment Authorization.) If the marriage does not take place within 90 days, fiancé(e) status will expire, and deportation may occur, or future eligibility for U.S. benefits may be affected. To learn more about U.S. visas and the immigration process, and to take advantage of our array of immigration services, please contact KPPB LAW at (703) 594-4040 or send us a message online. It is advised that petitioners for the K-1 visa and potential spouses seek professional help to ensure all application materials are submitted properly and in a timely manner, and to help guard against any delays or visa denials.